In the beginning when I was researching everything candle related, I learned that when a candle “tunnels”, it’s a bad thing. The goal is the have a smooth and even surface. 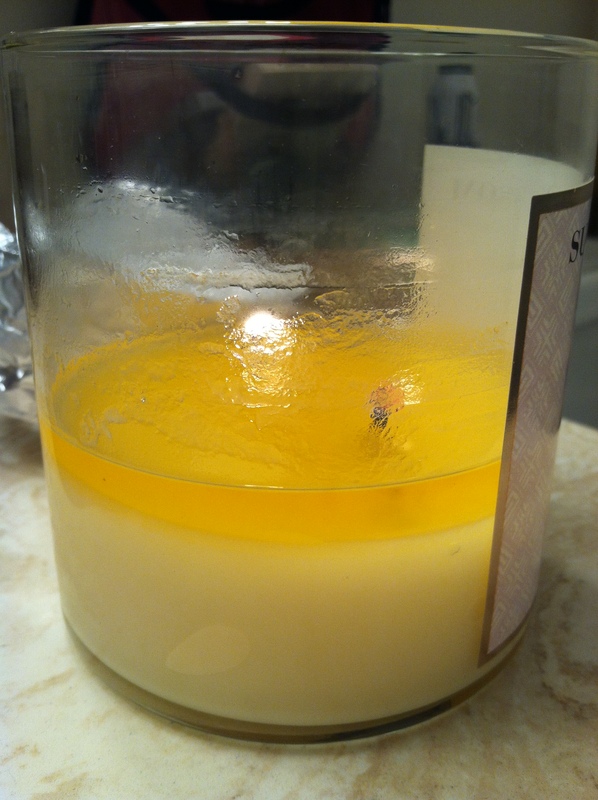 When a candle tunnels, you’re wasting a lot of wax on the side and therefore not really getting your money’s worth. Sometimes you’re left with a lot of wax that can still be melted, which means there’s a lot more lovely scent to smell, too! So how can you prevent this? 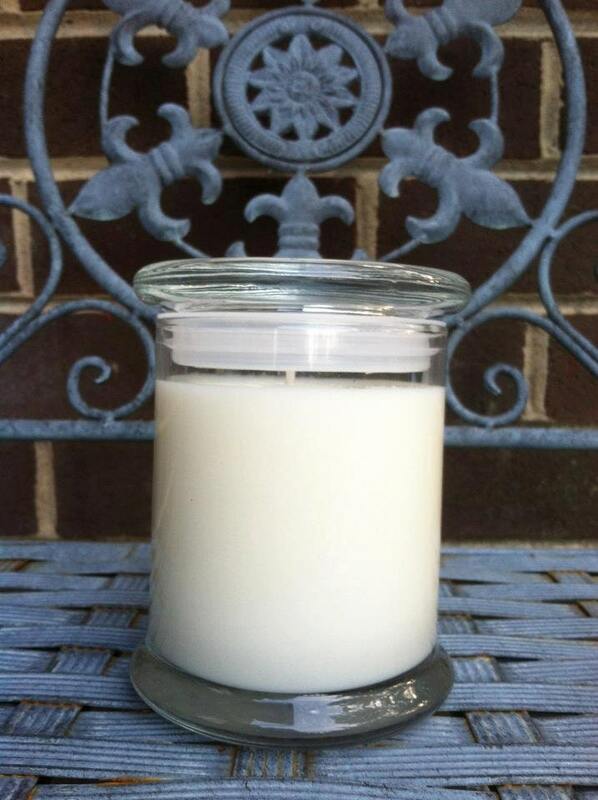 Some candles are poorly made and will tunnel no matter what you do, and this is mainly do to wick size. In the above picture, the wicks are a little too small (in my opinion) for the jar. Three wicks would have been better considering the size of the container, and you would get a much better even burn. Instead, it started to tunnel. Sometimes tunneling happens due to the very first time you’ve lit your candle. You maybe allowed it to burn in perhaps 30 minutes or less and blew it out for whatever reason and didn’t get a good wax pool going. Candle wax has “memory” and the next time you light your candle, it will “remember” how far the previous wax pool was and only melt to that point. What you need to do is on that first burn, allow the candle to stay lit until there is a complete and even wax pool, meaning the wax has completely melted to the edges of the container. Otherwise, it will melt through the center of the candle, wasting a lot of wax. I’ll show you what I mean in a picture. But let’s see how you can fix this. I learned this trick by watching many youtube videos a while back. 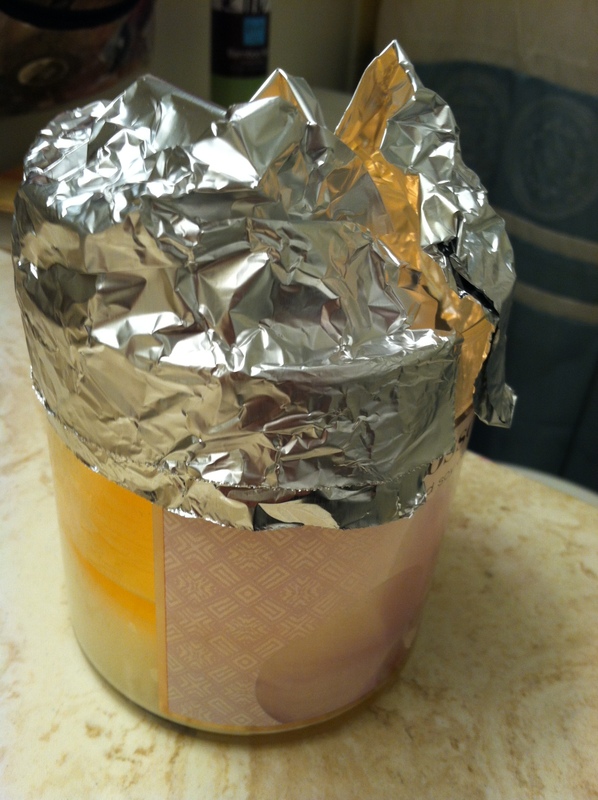 The best way to do it is by getting some aluminum foil and wrapping it around the candle, making a dome shape on the top. This allows the heat to stay in and melt the wax on the sides, and in an hour or so you should have a good even wax pool. Please be careful when removing the foil, it will be hot. 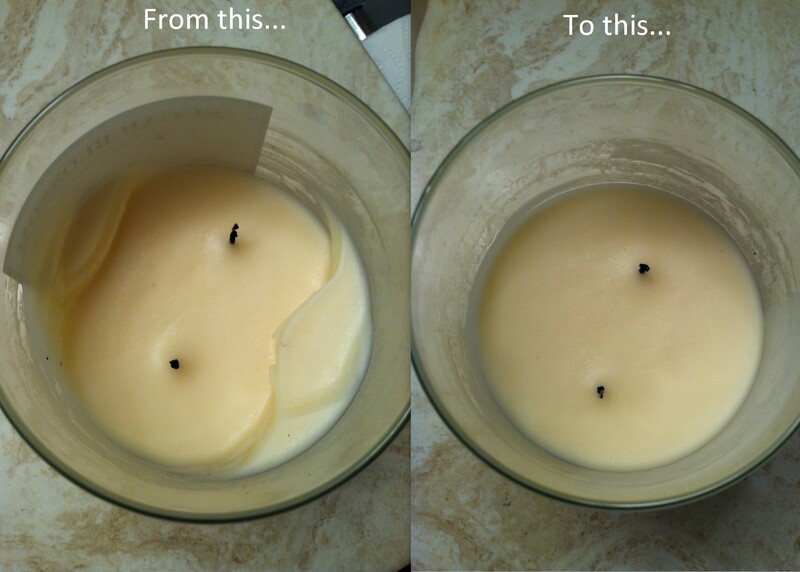 This happens to all my candles thanks for the tip! Thank you! I tried this on a candle I thought was ruined and now it is fine! Absolutely! Glad I could help. 🙂 Thanks for reading. Glad to find this! I just got a candle I really like and already have tunneling. I’m delighted to know I can save it. Thank you. So glad you found the tip 🙂 Good luck! 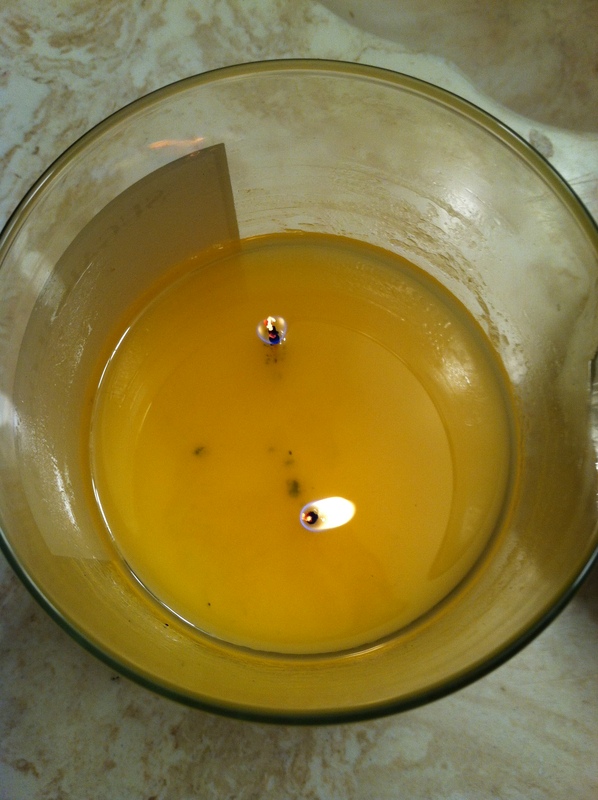 Hello, do you add the foil when you first light the candle or do you wait until you already have a pool of wax? Hi Nichola! After you light it, add the foil. 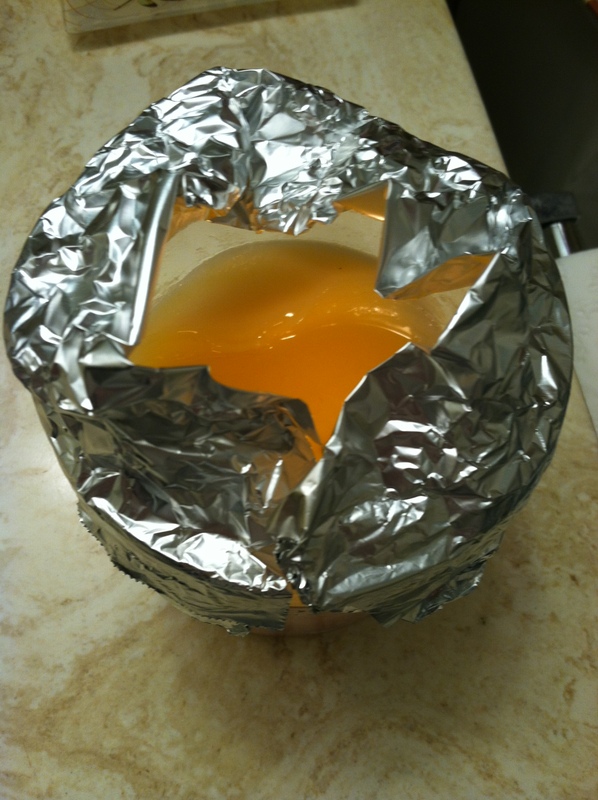 Once you have it lit and the foil over it, the heat will build in the foil “dome” and melt the wax evenly. I have a candle that’s tunneled pretty deep. The center part is so small compared to the wax on the sides that it will hardly stay lit. Is there any hope for it? I would say get a warmer plate (or hot plate, as I think they’re called) and put the jar on top of that and simply let it melt. No flame to worry about and you can still enjoy the scent. You might be able to find one at a craft store. The warming jar is a great idea and this way you can still enjoy the scent. Thanks for the tip. It’s a small tunnel so I hope that when I try this tomorrow it will save it! I didn’t work, the tunnel got bigger but not enough to melt the sides too- it was a cheap candle though so I guess its to be expected. This worked perfectly for my new dyptique that had a small tunnel. Thank you soooo much!!! Ive been watching it for a while, how long does it take to go flat? It might take a few hours to do, especially depending on how deep it is. Keep working at ir, and hopefully it’ll even out. Sometimes certain candles are more stubborn than others. this is saving my yankee candle that had about 2mm of tunneling, thank you!!! I took this to the next logical level. Used an old metal lid from a sauerkraut jar and cut a 1″ hole in the middle. Reusable and a bit more efficient at holding in the heat to pool the wax. Just sit the lid on top of the candle jar and watch it work. so glad that you actually took time and your braincells to think about this candle fixing method! I actually do this from the first light of a new candle anymore. That way it doesn’t tunnel from the get go. It works great, thanks for the tip. ALL of my Yankee candles would tunnel, some partly my fault (blowing out too early) and some were just not great. I’m so glad it worked! Yeah, sometimes Yankee is hit or miss, even with scent throw, which is frustrating considering the price. I cut the wax on two sides of the candle before I saw your solution. Am I doomed??? Wick is so small the candle won’t stay lit. You mentioned using a warming plate – you mean to set the candle on it? That didn’t help. I can’t see how this works for so many people and not for me! I’m frustrated with these candles. I would light it and pour some of the melted wax out or scoop it out. It sounds like the company may not have used the right wick Maybe save the wax you scoop our to melt later when the candle is done. I didn’t have foil, but this sparked an idea, so I asked my dad if I could borrow his torch. It actually worked out well, I just had to move some of the hot wax around the container, and when the wicks looked like they were drowning I just poured the excess wax onto a paper plate. It took about 5 minutes. So, thanks, I guess! honestly was kinda doubtful but this actually worked pretty good! thx queen. Also try a Candle-Topper.com top — it will prevent tunneling and even fix those which already started down the tunnel road — and they look great. I tried to use this trick on some of my mom’s candles but the problem had already gotten so bad that the process stopped halfway because the wick became submerged. help! Abscents Is Featured On Gloss48! Lemon Pound Cake Now Available!